Covering an area roughly equivalent to that of Western Europe, Kazakhstan is the largest of the former Soviet States, and the ninth-largest country in the world. Its strategic location makes it ideal for accessing both the Russian and Belarussian markets, as well as offering a gateway to other central Asian countries. It has a stable economy and setting up a business there is relatively easy. The Eurasian Customs Union free trade agreement between Kazakhstan, Belarus and Russia covers approximately 170 million people. Kazakhstan also signed the Commonwealth of Independent States Free Trade Area in 2011, but has yet to ratify it. As far as agreements with the UK go, there is a double taxation agreement between the two countries and an agreement to promote and protect investments. Kazakhstan’s economy is the largest among the Central Asian states. Growth potential is also good, with the economy growing by 6% in 2013, and expected to grow by an estimated 5.5% in 2014. Its oil and gas reserves account for 30% of total GDP and 80% of exports. A number of other valuable commodities are mined in the country, such as uranium, copper and zinc. There is also a large agriculture and grain industry. The government is committed to improving their economy, and recently published an ambitious programme, Strategy 2050, which aims to establish Kazakhstan as one of the top 30 most competitive nations by that year. As the country is so reliant on its gas and oil exports it was badly hit by the global recession, but has rallied well, helped by recovering commodities prices. The government has realised that its reliance on one industry has left the country vulnerable, and has committed to diversifying the economy to make it more robust. The Kazakh government wants to increase local involvement in projects, contract, personnel and goods and services. Meeting these local content requirements usually means achieving a certain ratio of cost and goods that are verified as being from Kazakhstan, and also employing a certain number of Kazakh nationals. It is a complicating factor, and something that you will need to research for your sector, and factor in to strategic plans. While new laws have been introduced to improve the business environment, these are often incorrectly implemented at local level which obviously reduces their effectiveness. Potential exporters should also be wary of Kazakhstan’s current ranking – 140 out of 177 nations in the Corruption Perceptions Index. If you are in need of any guidance on this issue, the Ministry of Justice has published a guide called Bribery Act 2010: Guidance to help commercial organisations avoid bribery. Until 15th of July 2015, Kazakhstan has a visa free programme for UK citizens to stay for up to 15 days. If you intend to stay longer, then you will need a visa: the Kazakh Embassy in London has up to date details on what is required. 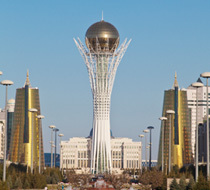 A permit is required to work in Kazakhstan, which needs to be obtained by a Kazakh employer. Within Kazakhstan, the National Institute of Intellectual Property is responsible for intellectual property (IP). If you are considering doing business in the country, it is best to discuss strategies with your legal team to protect your IP prior to entering the market. Despite Kazakhstan having signed up to most of the major international agreements and conventions to protect IP, local laws can be weakly enforced. Goods on sale in Kazakhstan need to be labelled in both Kazakh and Russian. The country is working towards coming into line with international standards and is a member of the International Organization for Standardization (ISO). At present, technical regulation is managed by the Committee on Technical Regulation and Metrology. Product certification is managed by the government owned National Center of Expertise and Certification. Kazakhstan is a country with a complex history and ethnic tensions. To avoid causing offence, it is important to note that only people of the Kazakh ethnic group are known as Kazakhs. If you are not sure of someone’s ethnic background, it is safest to refer to them as Kazakhstanis. All people in Kazakhstan, regardless of their ethnicity, can be referred to as Kazakhstani without causing offence. While Kazakh is the official language of the country, Russian is more widely spoken. If you are looking to do business in this region, it is best to have your business materials translated into both languages. In Kazakhstan hierarchy is seen as very important, and it is expected that the eldest or the most senior person in the delegation will make the decisions. Handshakes are common during introductions, but as a large proportion of the population are Muslim, businessmen may not shake hands with women. This is not meant as a sign of disrespect and should not be taken as such. Protecting honour and showing respect is a very important part of Kazakhstani culture. This means that, often, issues will be finessed and talked around rather than being tackled head-on. It is best to respond similarly, questioning and probing gently rather than being too forthright. On the other hand, while Kazakhstanis can raise their voices in order to get a point across, be wary of doing similar as the line between being assertive and aggressive is very thin. The city of Astana will be hosting Expo 2017. The theme for the expo is ‘Energy of the Future’, creating a great opportunity for British businesses in this sector to promote themselves in Asia and further afield. Expected projects include the construction of a green village and an Expo City, transport infrastructure upgrade projects, supply of low carbon technologies and design, engineering and consultancy services. Moreover, in preparation for the Expo, ‘Smart Astana’ has been established to get the capital city ready for the event while also providing useful infrastructure and amenities for the people of Astana afterwards. As one of the top ten grain producers in the world, agriculture is at the heart of the Kazakh economy. The government is looking to develop all regions and improve crop production and animal production. There are a number of industries related to the agricultural sector that have potential for UK businesses. While Kazakhstan is looking to diversify and broaden its economy, the fossil fuel industry remains its biggest sector. There are a number of opportunities for UK businesses involved in this area through the supply of engineering equipment and the manufacture of oil and gas equipment. Additionally, there is a demand for expertise with regard to the treatment and disposal of liquid and solid waste, and also the effective management of oil spills and safety issues. Kazakhstan has a favourable position and climate for a number of renewable energy sources, such as hydropower, solar power and wind. Perhaps because of the strength of the fossil fuel industry, this potential has not been exploited. Indeed, green fuel options make up a mere 1% of energy utilised within the country. The Government wants this to increase to 3% by 2020 and 30% by 2050. This means that there is a huge amount of scope for businesses who specialise in consultancy services in areas such as green energy, waste management, energy efficiency and engineering and construction services for onshore wind, solar and biomass power. Education is another industry where UK companies can succeed. There is a shortage of local expertise in certain sectors, meaning that expats are needed to help the economy. There is a large number of foreign staff employed in essential sectors such as oil, gas and mineral extraction. This is something that the Kazakhstani Government is looking to address through the introduction of a variety of educational measures. There are opportunities for British companies here when it comes to the provision of these educational measures, including education resource provision, vocational training, English language training and a variety of different types of corporate training. Kazakhstan may not be an easy market but firms that approach it in the right way will find an increasingly prosperous environment, with strong demand for quality and expertise in goods and services.